Beef Burgundy has a special place in my heart. This is - hands down - my favorite dish that my mom makes. It's the ultimate comfort food: beef, carrots and onions in a rich, flavorful red wine broth over egg noodles. What could be better on a cold winters night? 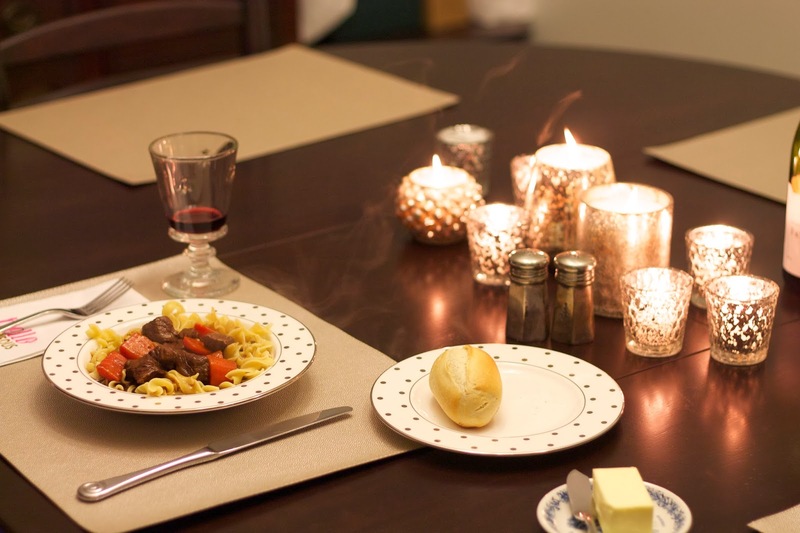 Last night, I made this for Mike for a nice date night at home. 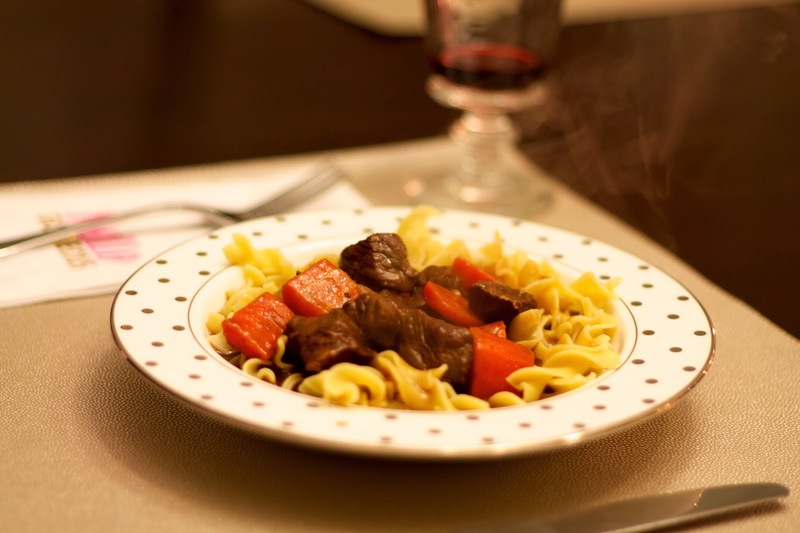 He absolutely loved it and it's great because you can clean up all the dishes while the beef burgundy is simmering away- making it perfect for a relaxing dinner at home. Begin by browning the meat and vegetables. First, pat the meat dry with a paper towel and season generously with salt and pepper. Preheat a dutch oven to medium high heat. Add olive oil and 1 tbsp. butter. Add half the meat to the pan and brown on all sides (no need to cook through, you just want to seer the meat). When the first batch is done, remove it from the pan and set aside on a plate. Repeat with the second batch of meat, then the carrots, adding more butter and olive oil if needed. When the carrots are browned, set them aside with the meat, reduce the heat to medium low and add the onions. Sauté the onions until they're soft and slightly brown, then add garlic to the pan and sauté for one minute. Add two tablespoons of flour to the pan and cook one more minute to remove the raw flour taste, stirring well. Add the red wine to the pan and scrape up any brown bits with a wooden spoon. Bring the wine to a boil, stirring often, for 3-4 minutes until it's slightly thickened. Add the beef stock, return the meat and carrots to the pan, then add bay leaf, worcestershire and browning sauce. Reduce heat to low, cover, and let simmer 1.5-2 hours, or until the meat is tender. To thicken the sauce before serving, spoon 3 tbsp. of the cooking liquid into a small bowl. Add two teaspoons of flour to the small bowl and mix it well with a fork to dissolve any lumps. Bring the beef mixture to a boil and add the flour mixture, stirring well to incorporate it. Repeat until desired thickness is is reached (I only did this once - the beef burgundy will be slightly thinner than a traditional beef stew). Serve over egg noodles. Enjoy! Sounds delicious. I'll have to make this for my hubs as a surprise.